On Friday, September 6, the whole team here at REO turned off their computers earlier than usual and headed out to the Shropshire Food Enterprise centre. But they weren’t on the lookout for a post-work pint or snack, as you might be tempted to believe. Instead, everyone entered the Pork Pie Event and Competition organised by Heart of England Fine Foods. The pie making event and competition was REO’s way of welcoming Tim Cook, the company’s new business development manager to the UK team. Everyone enjoyed themselves and got to take home some rather impressive baked goodies! The afternoon started with a pork pie making class hosted by resident chef Danny in the kitchen of the Taste cafe. The demonstration was clear and gave everyone the necessary tools and information to create their own take on this classic recipe. Danny started by explaining how sourcing local, quality ingredients is the foundation for creating culinary masterpieces that are good for the family and also for the community. The chef also demonstrated kneading techniques and most importantly, showed everyone how to avoid that dreaded ’soggy bottom’! Armed with this precious knowledge and a handful of great ingredients, it was now time for everyone to show what they had learned. 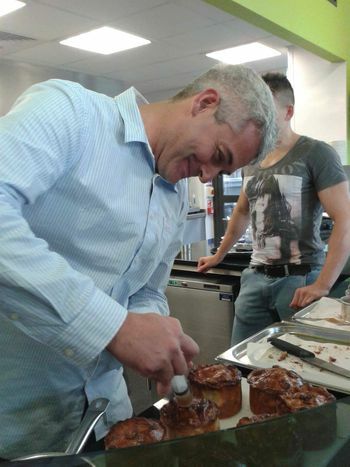 Each member of the team created their own signature pork pie. Some opted for more traditional recipes whilst others even sought inspiration in fusion cuisine. The divide between gelatine supporters and those who prefer their pork pies without jelly also sparked some fiery debates. Steve Hughes, our managing director was in the pro-jelly camp whereas Michelle, our marketing manager decided against the disputed ingredient. Steve, pictured left, injected his pies with gelatine before letting them settle. After the dough was kneaded and the pork was minced and seasoned, it was time for the pies to rest for a bit in the oven while the team took a much deserved break for some wine and refreshments. But ultimately the proof is in the pie (and sometimes the pudding) so the finished goods were tasted and marked in great secrecy by the ladies at the Shropshire Food Centre. Michelle Gillam was pronounced winner with her classic take on the traditional English recipe.gh was kneaded and the pork was minced and seasoned, it was time for the pies to rest for a bit in the oven while the team took a much deserved break for some wine and refreshments. “We all owe thanks to Lydia Esp, our company finance manager,” explained Steve. “Lydia came up with the idea and organised the whole event, making it a fun afternoon and also a great evening. We all went for a cheeky drink after the pie competition which allowed everyone to get to know each other better, outside the busy engineering environment. I guess it’s a matter of the team that bakes together stays together,” he concluded.